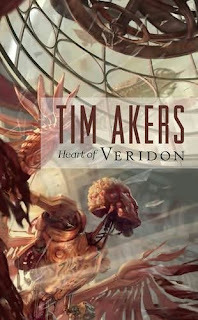 Heart of Veridon immediately caught my interest because of its Crime Noir and Steampunk themes, which it more than lives up to. Jacob Burn born into one of the founding families of Veridon is a cyborg of sorts with mechanical parts surgically implanted in his body in addition to his eerie silver eyes, which mark him as a zepliner pilot with the ability to standup to a lot of physical damage. Zepliner pilot is a very prestigious position for any citizen of Veridon as it take years of study and dozens of surgeries. Yet Burn failed as a pilot and turned to a life of crime for lack of motivation to do otherwise than drink. The noir style works well with wonderful dialogue and sequencing. From the first chapter Akers keeps the octane on high and never lets off the gas. The quick paced Heart of Veridon is very action oriented with Jacob getting into some kind of scrap every other page. He is able to get out of all it only to fall into the next trap or barging somewhere he knows nothing good will come out of. Yet he soldiers on to find out the truth. Still you have to get 200 pages in before you even begin to know what is going on and the motivations behind everything Jacob has been tossed into, which are pretty intricate. Jacob is helped out by a mysterious Anansi named Wilson. Akers creation of the Anansi species was impressively cool and original. They are a cross of humans and spiders, but don't call them spidermen or bugs. I'm very curious about their culture as you only meet Wilson, but there is obviously a lot more to them. The female lead, Emily, needed more fleshing out earlier on as she comes off a bit sidekick-ish. Akers was clearly trying to make her the strong-willed type, but it didn't really pan out that well and she came off bit as the damsel-in-distress who kept putting herself in danger in the first place. Her actions in one particular scene towards the end seemed unneeded and very impetuous given her nature throughout the rest of the narrative. Another problem I have is with the title. While Heart of Veridon is wholly apt I don't find it is evocative of much. If it had been given a title that spoke of the Steampunk and Noir aspect a bit better I think a larger audience would find the book on shelves, because it deserves a wide readership. Akers knows how a spin a tale with depth, complexity, and a bit of humor. There are are a lot of interesting aspects including the mysterious Church of the Algorithm and a mechanical Angel who means business along with aristocratic echelon intent on selfishness, which always means a good time. This review came out a bit more negative than I anticipated because I did enjoy it immensely. Heart of Veridon had me enrapt with the pulp style story and characters until the last page. I give Heart of Veridon 7.5 out of 10 Hats. There is a lot left to this world to explore and I hope Akers gets the chance to tell those tales. He has already mentioned the follow-up was to be titled Death of Veridon, but since Solaris has been taken over he is unsure of the fate of the series. UPDATE: It has been confirmed the sequel now called The Dead of Veridon will be released in 2011. Akers has signed on for a a new series with Pyr starting with The Horns of Ruin, which is another Steampunk and Noir or Noird themed book in an urban setting slated for a late 2010 release. I'll definitely be checking it out as I'd like to see how Akers grows. 200 pages? That's a long time before you know the main plot. But the cover is amazing. Agreed on the cover art. I believe it was the same artist as Priest's Boneshaker. In the book's defense that 200 pages goes really quickly. Also, this is the most oddly formatted mass market pb I've seen in a while. It has very large margins, which I appreciate, but it does make the book longer than it really is.